This ski-in/ski-out luxury condo is located in the heart of the ski village close to all that the resort has to offer during both winter and summer. Whitefish Mountain Resort, formally knows as Big Mountain, has it all! From world class downhill skiing in the winter to mountain bike trails in the summer as well as ziplines, tree-top walks and hiking galore. This condo is located about 35 minutes to Glacier National Park and less then 10 minutes to downtown Whitefish and Whitefish Lake, it's a perfect location to be close to all of the amazing activities and sightseeing out Flathead Valley has to offer. 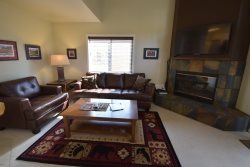 Luxury condominium in Whitefish Mountain Resort with 3 bedroom and 3 bathrooms. The master bedroom has a king bed, second bedroom has a queen and the third bedroom has a queen bed and twin rollaway. Condo has portable air conditioning units for summer. Amenities include: washer/dryer, gas fireplace, rooftop hot tub, BBQ, heated ski locker, fitness room, heated underground parking garage, (please note that there is limited height access of 6'6"). Easy to follow instructions were appreciated. Friendly staff and appreciated the call on our day of arrival to provide directions to pick up keys. Everyone was very helpful and prompt to respond. Thanks for helping make our family trip lodging experience a smooth one! We enjoyed the condo very much. It was well taken care of and is in a beautiful location.